i made a run in the street and measure with gtech pro. It shows 8.43 in eight mile run and 1.98 in the 60 mark. autostick and what fuel is better for better times? Hows joels tune? Any diff between Joels and Johan tune? did you run your srt8 08 stock at the track before any mods. which was the next modification you will made, if you have it now? what you think about headers? you told mi it has johan diablosport tune. can i put stock with other programer or change parameters? if i need original programer, do you have yet? and for last, do you sell it? I talked to Paulo about adding gas and he said if your 60' is ok they just add 3% in the mid and top. He said running lean in the botton is better so dont touch it other wise you may kill your 60'. What do you think? 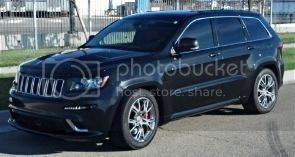 09:59 AM - A.V.GCSRT8 quoted JEEPYOU in post BROKE DOWN! Coolant resivior bubbling.